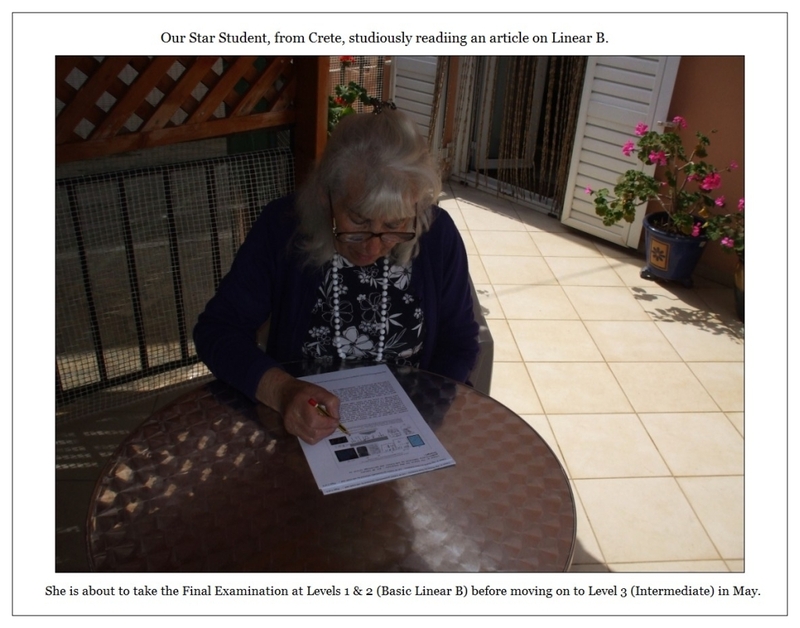 Our Star Student, Rita Roberts, has scored 89 % on her Final Examination at Levels 1 & 2 (Basic)! Congratulations are in order! Rita first came on board with us here at Linear B, Knossos & Mycenae just 2 short months after the blog was brought online, in May 2013. 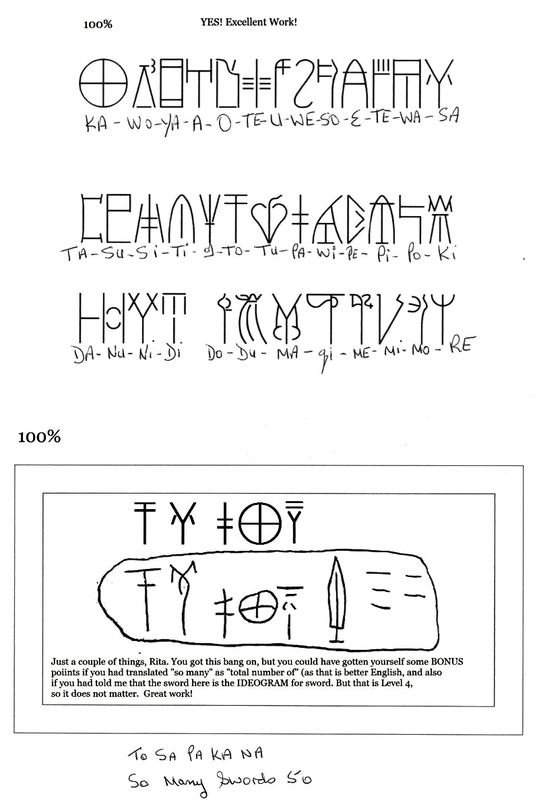 So now, in just less than a year, she has mastered all of the 70 or so basic syllabograms in Mycenaean Linear B. Having passed the Final Examination at Levels 1 & 2 with flying colours, Rita is now at a crossroads. In May she begins Mycenaean Linear B Level 3 (Intermediate), which will seem like a cake-walk after the tortuous path she (and I and anyone) would have to follow to master the most challenging part of the Linear B syllabary, i.e. the entire Basic Syllabary, especially in those instances where the student has no prior knowledge of Greek at all, as Rita did when she first approached me in May 2013. Now, not only has Rita mastered the Basic Syllabary of Mycenaean Linear B, she has a vocabulary of at least 1,500 words under her belt, and she is more than ready (and willing, I dare say!) to tackle Level 3 (Intermediary)... and beyond!, which will allow her to master all the remaining syllabograms, most of them homophones, plus a few other bizarre ones, raising her total to some 90+ syllabograms by the time she has finished with Level 3. After Level 3 come Levels 4 & 5 (Advanced), which deal almost exclusively with Ideograms, which we have already covered in great detail in our Blog. In fact, almost the lessons at all five levels are already posted on the blog, so if you are willing to take a stab at yourself, please feel free to do so. 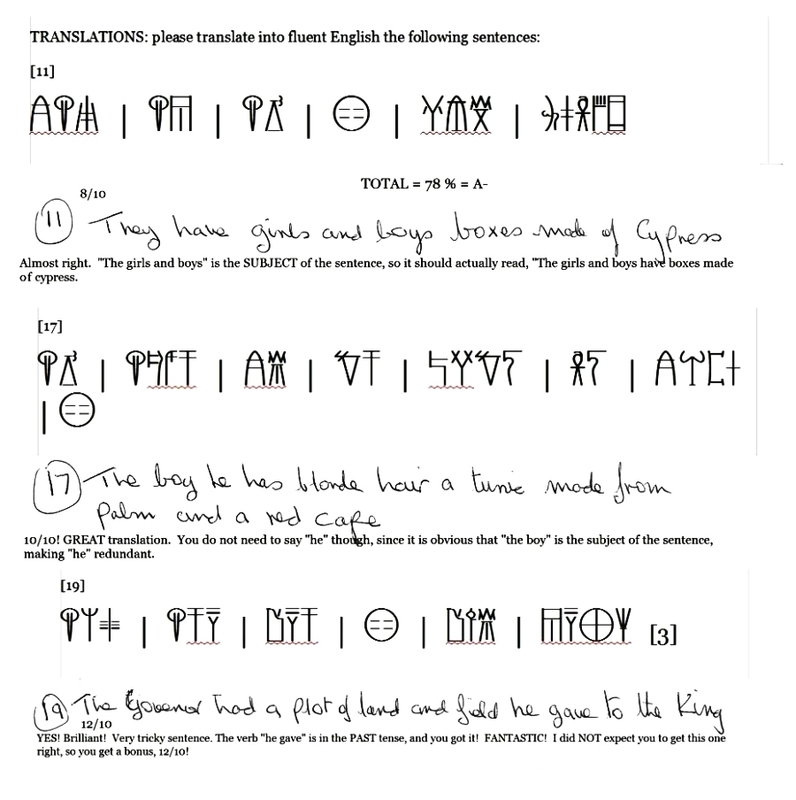 In Question 10,  I asked Rita to translate a tablet which teachers routinely ask introductory students to Linear B to translate, and here again, Rita aced it (see above). Rita scored 100 % in the first 10 Questions. On a final note, I am delighted to inform you all that from here on in, Rita and I will be sharing the responsibilities for (a) bringing new Show & Tell flashcards to the blog for the learning pleasure of any of you who would just like to be able to identify a few Mycenaean Linear B words by sight & (b) we will henceforth also be working together as a team to post our translations of several hundred of Sir Arthur Evans’ Scripta Minoa Linear B fragments and tablets, which we shall be posting on a regular basis indefinitely. So keep posted, since you will be hearing a lot more from my research colleague, Rita Roberts, throughout 2014 and beyond. 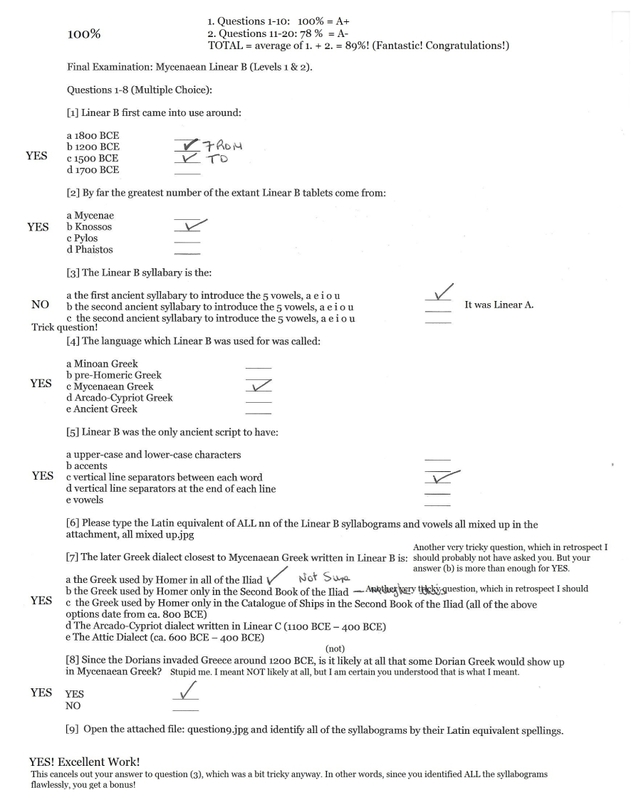 Lest anyone think that the Final Examination even at Levels 1 & 2 (Basic) is easy, it would be wise to disabuse oneself of such notions, as will become perfectly clear when I post the 20 questions in the Final Examination once our student has taken it. She is already extremely proficient at this level, and has even managed to translate parts of some Linear B tablets, and can in fact translate at least one of them in its entirety, if she puts her mind to it... which I am sure she will. Considering that she was not greatly familiar with Greek, ancient or modern, prior to taking our course, I am simply astonished at how quickly and methodically she has mastered the basic syllabary of Linear B in 10 short months, hence Mycenaean Greek itself, which is after all, the earliest ancient Greek dialect. It takes guts and more than the usual perseverance to tackle a task as formidable as this. She has scored extremely high marks in 24 practice sentences, some of which are very hard to translate, and I have no doubt whatsoever that she will excel in her final examination at Levels 1 & 2, after which Level 3 (Intermediate) will seem like a breeze in comparison... because it is. I expect our friend to be able to move onto Level 4 (Advanced I) by the autumn of this year, and Level 5 (Advanced II) early in 2015, at which point she will be (almost) as proficient as I am in deciphering and translating Linear B tablets. In fact, even at the end of Level 3 (Intermediate) she will be able to easily translate quite a few tablets. Every one of her translations of Linear B tablets, regardless of source (Knossos, Pylos, Iklaina, Mycenae etc.) will be posted here on our Blog, even when they differ from my own translations... which they sometimes will. No-one has a monopoly on “correct” translations of Linear B tablets, which are, more often than not, open to fairly wide interpretations. I look forward with great anticipation to our friend's decipherments later this year and throughout 2015 and beyond, as her expertise grows and matures. Sooner or later, she and I shall be sharing the limelight in deciphering Linear B tablets, which is just fine with me.